NATAL: Luis Suarez shocked the World Cup with a new biting storm Tuesday as Uruguay sensationally dumped ten-man Italy out of the tournament with a dramatic 1-0 victory. Uruguay captain Diego Godin hit an 81st-minute winner in the gritty Group D battle that saw Italy knocked out in the first round for the second straight World Cup. But Italy's stunning exit was overshadowed by an incredible incident involving Suarez -- already banned twice before for biting opponents -- just moments before Godin's winner. 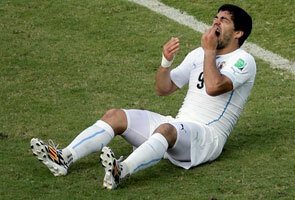 Television replays showed Suarez appearing to attempt to sink his teeth into Italian defender Giorgio Chiellini's shoulder in an off-the-ball incident. Chiellini angrily remonstrated with Mexican referee Marco Rodriguez, pulling his shirt off his shoulder to show red marks on his neck. 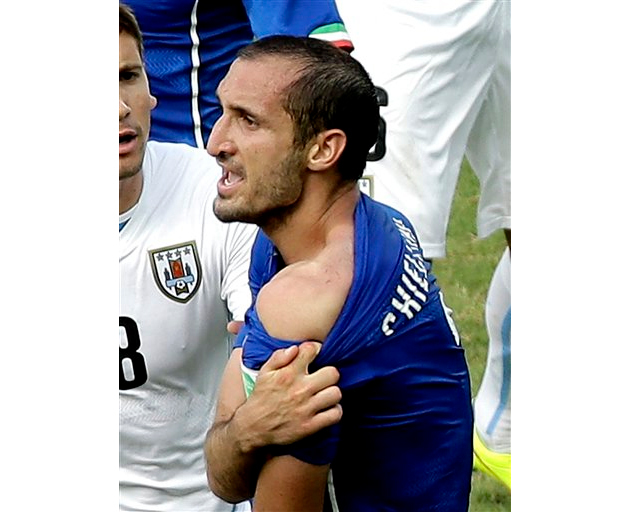 Afterwards a disgusted Chiellini told Italian television: "He bit me, it's clear, I still have the mark." "The referee should have blown his whistle and given him a red card, also because he was simulating," added the Juventus player. Uruguay's veteran manager Oscar Tabarez pleaded ignorance of the incident. "I didn't see it. I'd like to see the images first," he told a press conference. Tabarez also suggested Suarez was being victimised by journalists. "He is the preferred target for a lot of media," Tabarez said. Pressed on the issue, a visibly irritated Tabarez refused to condemn Suarez. "This is a football World Cup, it's not about cheap morality." FIFA said it would study the referee's report and the match video. "We are awaiting the official match reports and will gather all the necessary elements in order to evaluate the matter," FIFA spokeswoman Delia Fischer told AFP. But other officials were quick to condemn Suarez. "There is no doubt Luis Suarez is a fantastic footballer but once again his actions have left him open to severe criticism," FIFA vice-president Jim Boyce told the BBC. "There is no doubt that Fifa must investigate this incident very seriously and take whatever action is deemed necessary." If found guilty by FIFA disciplinary chiefs, the incident would almost certainly mean the end of the tournament for Suarez, painted as a villain at the 2010 World Cup for his deliberate goal-line handball which denied Ghana a famous quarter-final victory. In November 2010 he was banned for seven matches by the Netherlands FA after biting PSV Eindhoven's Otman Bakkal on the shoulder when he played for Ajax. Suarez was dubbed "the Cannibal of Ajax" by Dutch media. In April 2013, he was given a 10-match ban by the English FA after biting Chelsea defender Branislav Ivanovic in a match at Anfield. He was also banned for eight matches in 2011 for racially abusing Manchester United's Patrice Evra. Italy, who had Claudio Marchisio sent off in the second half join a growing number of European sides on the World Cup scrapheap after the exit of Spain, England, Croatia and Bosnia. In Group D's other game in Belo Horizonte, Costa Rica ensured England's miserable World Cup ended with a whimper in a 0-0 draw. The result meant Costa Rica win the group, unbeaten after three games, with Uruguay finishing as runners-up. Costa Rica will play Group C runners-up Greece on Saturday after they scored a last-gasp 2-1 win over Ivory Coast to scrape into the last 16. An injury time penalty from Georgios Samaras clinched victory for the Greeks and left Ivory Coast players shattered. The Africans had recovered from falling behind to an Andreas Samaris goal to level through Wilfried Bony on 74 minutes. Colombia wrapped up qualification for the last 16 with another impressive win, destroying Japan 4-1 in Cuiaba. Juan Cuadrado, James Martinez and Jackson Martinez (2) scored for Colombia with Shinji Okazaki the lone scorer for Japan. The match also saw Colombia substitute goalkeeper Faryd Mondragon make history, becoming the oldest ever player at a World Cup at the age of 43 years and three days. Mondragon's appearance surpassed Cameroon legend Roger Milla, who played at the World Cup aged 42 years and 39 days.